Serious question: why the hell is Raging Bull more renowned than Rocky? I know that it’s not like people don’t love Rocky, because they do. But for example, on AFI’s top 100 movie list, Raging Bull is number 4 while Rocky is number 57. After seeing both of them now, this really just makes no sense to me. So, to be honest, I wasn’t really expecting to enjoy Rocky all that much. I really didn’t think Raging Bull was enjoyable, and I was expecting the same from Rocky: that it would be about this big brute of a guy who beat men up for a living and treated women badly. Rocky is not at all like that. Rocky (Sylvester Stallone) really is incredibly interesting. I don’t think I’m being easy on the character just because this is a sports or boxing movie. From early on in the movie, we see that while Rocky is tough, by roughing up a guy for money he owes to the mob, he’s also empathetic and sensitive, because the mob guy wanted Rocky to break the guy’s thumb, but Rocky didn’t because he knew an injury like that would get the guy laid off (and, logically, wouldn’t help because then he’d never have the money). He cares for and talks to his animals, two turtles (named Cuff and Link ADORABLY) and fish and it’s also worth mentioning that he has a poster of puppies in his apartment. He has a nervous crush on Adrian (Talia Shire), the mousy girl who works at the pet shop he frequents. He’s a sweet guy who, despite being a boxer and looking like Sylvester Stallone, thinks he’s a loser who probably won’t get anywhere. You don’t really see the arrogance in him that shows up in other athletes on film. 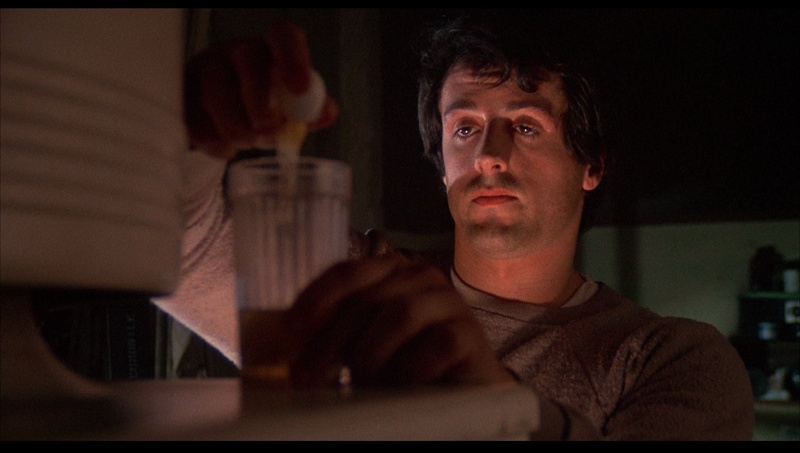 This is probably the most clear when, as Rocky’s big fight against Apollo Creed (Carl Weathers) is coming up, he tells Adrian that he really doesn’t expect to beat Apollo, despite all of his training, but he just wants to make it through all of the fight’s rounds. I just don’t think this is a trait that comes up very often in sports movies: the underdog doesn’t think he’s going to win because that’s unrealistic, but he wants to make his opponent really fight for the win. And then I was very surprised when Rocky didn’t win the fight, which makes Rocky’s lack of arrogance all the more endearing because he was just being realistic. But the end scene is just so great, with the fight over and Rocky calling for Adrian and Adrian running into the ring and they declare their love for one another . . . Rocky didn’t win the fight, but he won at LOVE!!!! But yes, Rocky is really, truly great. Rocky is complex, Adrian is complex, their relationship is realistic and sweet, and Rocky is a character that you really want to root for because he really is a good guy. There’s also a pretty amazing part when Adrian brings Rocky a big ole dog from her pet shop for him to run with, and Rocky is so happy and sweet towards this really cute dog that it’s just too much. This is really what a movie should be. Great fights, a good love story, and beautiful cinematography. And the coolest thing about this movie to me is the fact that Sylvester Stallone wrote it. This film really is a great American movie. Of course Rocky is a real great example of success but watching this movie again reminded me a lot of when I was boxing. I mean I never became great at it, I never got below 200 to fight in a tournament (I was at 204 at the best), and I broke my nose in my first fight. But there is something so fantastic about trying to do something that you want to do and accomplishing it. Granted it’s easy to relate that feeling to this movie cause it’s literally the same topic but this movie has such a good message without being cheesy.